Okay, this whole 60 degrees one day, 30 degrees the next thing has got to stop. My hands just can't take it much longer! 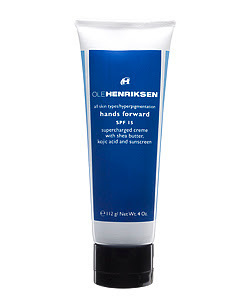 But luckily I discovered Ole Henriksen's Hands Forward SPF 15 lotion recently. Formulated with wonderful, smoothing, softening shea butter -- which might as well have been the ancient gods' ambrosia, for all its amazing properties -- it makes skin visibly suppler in just one application. And with the addition of sunscreen, you'll be protected against harmful UV rays with every use! It will leave hands a bit greasy, but isn't that a small price to pay for unchapped, uncracked skin?